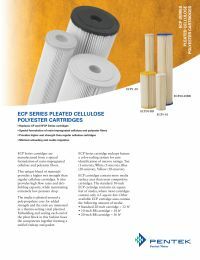 The Pentek ECP Series Filters are manufactured from a special formulation of resin-impregnated cellulose and polyester fibers. This unique blend of materials provides a higher wet strength that regular cellulose cartridges. It also provides high flow rates and dirt-holding capacity, while maintaining extremely low pressure drop. NOTE: Pentek CP replacement Filters fits Ametek, Filterite, Omni, Pollinex,Sears, Water Pik, Whirlpool, American Plumber, Campbell, Keystone andmany more.